Located just above the village, this property is in a protected residential area and benefits from amazing views. Access to the stone property via a large porch, into an entrance hall with cloakroom and guests toilet. On the left, the huge living room with 5m height ceilings and an exposed stone wall includes a dining area, a lounge facing the fireplace and a music lounge. To the south, access through French doors to a canopy with a summer dining area, facing the 9.5 x 4.5 m tiled concrete pool and lined with stone paved decks. On the side is the fitted kitchen, opening onto a small paved terrace. Bright master bedroom with its bathroom and separate toilet, as well as a small walk-in wardrobe, and access onto a covered private terrace. On the other side of the building, bedroom II with its shower room and toilet, and bedroom III in an alcove with bathroom and toilet. 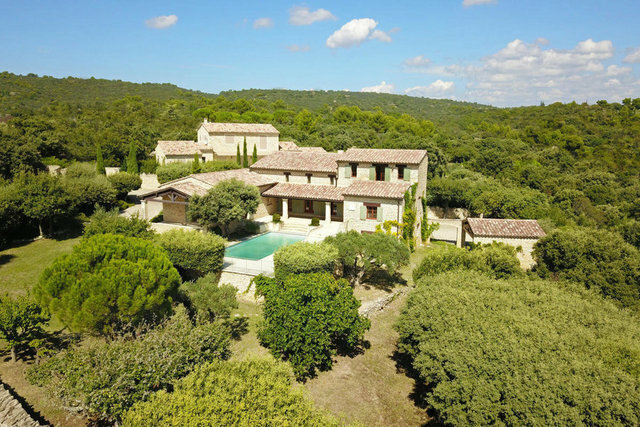 Upstairs, a mezzanine overlooking the living room is currently used as a study, and leads to bedroom IV with a shower room and toilet, benefiting from a roof terrace with panoramic views of the garden, the Luberon, the Alpilles and Sainte Victoire mountain. A staircase leads to the lower level, composed of a garage, a laundry room, a games room/bedroom V, several cellars and technical rooms thanks to the crawl space. A few steps away, an awning for 2 cars. Terraced and landscaped plot of land of 2500 sqm, closed with stone walls, planted with holm oak trees, cypress trees, fig trees, pine trees, apricot trees and superb olive trees, and with many lawns area, all with automatic watering system, alternating shaded areas and various chill out outdoor spaces.